EDITION F is the leading business and lifestyle platform for women. We are the first digital home base for career-oriented women and modern men as we provide incisive articles in our online magazine, career-enhancing contacts in the community, exciting companies and jobs in the job market as well as interesting business products in our affiliate shop. Career-oriented women are an extremely well-funded target group who are more than relevant to advertising. More and more women are graduating from university and are including career and professional fulfillment in their life goals. The share of female graduates increased from 39% in 1992 to 51% in 2009. According to a study published by executive search firm Egon Zehnder International, every third new managerial position in Europe is occupied by a woman. In Germany, 41% of top jobs went to women. These women represent a well-funded customer base that is extremely relevant to advertising - and companies are beginning to place them in the limelight. In other words, companies that are able to tailor their products and services to this particular target group will break into a market segment with an enormous sales potential. EDITION F caters to exactly this group. We focus on career oriented women who prioritize professional fulfillment and a modern lifestyle. According to Nielsen, a market research institute, this target group now makes 80% of all global purchase decisions. Companies, employers and advertisers have so far not had the opportunity to reach this target group directly. We want to change that. As the founders of EDITION F, we, Nora and Susann, are not only end users ourselves but also extremely experienced in the start-up, media and advertising sector. At our last job with German start-up magazine Gründerszene, we realized that we are an effective and complementary team. In the past, women were typically targeted with stereotypical topics such as fashion, beauty, gossip and dieting. The moment talk turned to economics, business or careers the tone became suspiciously masculine. What we needed was a space where business and lifestyle topics overlapped. EDITION F creates exactly such a space and is the leading business and lifestyle platform for women: incisive and personal articles in our online magazine, networking opportunities and the chance to exchange ideas with the community, direct links to companies and new job perspectives in the job market, as well as business attire and products for a modern business lifestyle in the affiliate shop. The fact that companies are looking for opportunities to access this relevant market is evidence of our rapid development. Bookings for company profiles and job advertisements, as well as premium cooperation, were the main reasons we were able to generate a five-figure turnover for the first time in November. We even generated initial commissions on the market place during the test phase. Since the job market was launched in October 2014, we have already won over renowned companies from various sectors for charged premium company profiles: the Axel Springer media house, car rental company Sixt, Deutsche Telekom accelerator Hubraum, the international photo community Eyeem as well as Factory, the center of the Berlin start-up scene. All these companies have recognized the potential behind our continuously growing community. We work with major customers such as the auditing company KPMG, successful start-ups including Mädchenflohmarkt and new companies such as Descape in the field of premium cooperation/advertising. We also entered into strategic and long-term partnerships with our network partners Tracdelight and Rewardstyle, premium shops such as Net-a-Porter and MyTheresa and brand stores including Topshop, Asos and Zalando for our affiliate shop. The amount of monthly visits to our site is our most important growth criterion. Since our launch in May 2014, we have doubled these visits each month. More than 55,000 women (78%) and men (22%) accessed EDITION F in October. In March 2014, EDITION F concluded its first Business Angel financing round worth EUR 150,000. In November, another financing round followed. Our investors include, amongst others, the venture capital company Vogel Ventures and West Tech Ventures as well as well-connected business angels who assist us in terms of strategy and content. These are, for example, Factory founders Simon Schäfer, Jan Honsel, former publishing director Gruner + Jahr Wirtschaftsmedien and current Pinterest DACH manager and TV producer Michael Heiks. Our innovative concept and business model received a lot of interest from the media prior to the launch and it keeps increasing. High-circulation media is approaching us proactively and is publishing positive reports. EDITION F won the largest independent silver media award, the Lead Award 2014, in the category "Online Independent of the Year". EDITION F currently features in "Promising Start-Ups: Look out for these 25 founders", published by Wirtschaftswoche and Handelsblatt. EDITION F founder and editor-in-chief Nora was named one of the "Top 30 under 30 Journalists of the Year 2014" by Medium Magazin. We want to broaden EDITION F's reach and improve our turnover in the coming years as well as increasing brand awareness in cooperation with you. All EDITION F content is freely accessible for visitors to the website. After creating and establishing the brand, as well as broadening our reach, we will also develop additional premium features including exclusive events, digital video advice sessions with top-class personalities or coaching and mentoring programs. For this purpose, we will develop a respective premium subscription model which will include a monthly fee and an annual subscription period. We rely on advertorials and campaigns (native advertising) in order to achieve the highest added value for our visitors and customers in the field of premium cooperation/advertising. The intention of our advertisers is to create accordingly labeled paid advertising that is less intrusive, attracts user attention and provides added value. Advertising formats will be created in cross media formats as required - on editionf.com, via our social media platforms, at events and, in part, through special print products. Furthermore, customers can book special formats such as premium banners. Advertorial prices start at EUR 950. Native advertising campaigns as well as special formats will be agreed upon individually and could, in combination with offline elements such as events, generate up to EUR 100,000 in revenue. In our job market, we provide companies with premium profiles that can be enhanced with an optional comfort package. Premium profiles are valid for a period of twelve months. Thanks to the profiles, companies can provide users with photos, video interviews and information while simultaneously integrating their social media feeds and current job advertisements in order to attract the most talented candidates through successful employer branding. The comfort package further provides conception and production of texts, photos and videos as well as realization and implementation of the profile on EDITION F.
Female business attire is often reduced to the pant suit - we think that needs to change because modern women want more. Women think in terms of events and outfits - interviews, customer meetings or business trips. That's where we come in. At EDITION F, we provide a regular and exclusive choice of brands and products. Aside from the most beautiful products and outfits, we also offer office supplies such as note pads, framed pictures and desk lamps. As an affiliate shop, we cooperate with premium shop networks Rewardstyle and Tracdelight. These networks enable us to cooperate with partner shops such as Net-a-Porter, MyTheresa, Topshop, Zalando and Asos. We function as mediators between shop partners and customers which means that we do not bear goods or logistics risks. We receive a commission of between 8% and 25% for all purchases. At the moment, we are referring to products and brands in our articles (editorial commerce). The next step will be to add a shop interface to the shopping area in order to further increase incentives and revenue potential. EDITION F is the first digital platform for career oriented women. EDITION F has consciously conquered a market niche and provides companies and brands with the option to directly, efficiently and creatively reach this target group. What is new is that we focus on the needs of the target group and create a product that addresses exactly those needs. Our algorithm gets to know members based on their individual behavior on the platform: If a member follows specific authors, buys certain products or even saves her/his interests, she/he will successively be shown stronger content that suits the personal profile. EDITION F makes it possible to filter through the flood of data and to individually curate content. 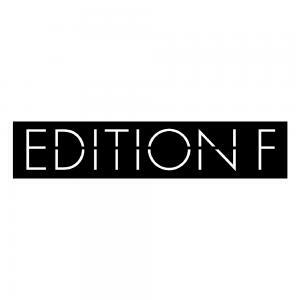 EDITION F provides its members with relevant articles, contacts, companies, jobs, fashion, products, offers and services. Since the job market was launched in October 2014, we have already won over renowned companies from various sectors for premium company profiles: the Axel Springer media house, car rental company Sixt, Deutsche Telekom accelerator Hubraum, the international photo community Eyeem as well as Factory, the center of the Berlin start-up scene. In addition there are many more companies that already have a basic profile in the job market: Outfittery, Wooga, Mykita, Bloomy Days, Zalando and many more. EDITION F job market homepage - where profiles and job advertisements merge. EDITION F is also an ideal platform for advertising customers: We have previously realized advertising projects for large companies such as KPMG and Facebook, for start-ups like Mädchenflohmarkt and for very young businesses including Descape. We are currently being approached by strong marketing partners which may enable us to generate additional potential for advertising companies in the near future. EDITION F is aimed at women in their early twenties to late forties who want to realize their professional potential. In the age group ranging from 20 to 50 years, there are, according to the German Federal Statistical Office approx. 16 million women in Germany; 39.1% of them have Abitur or a higher education degree. According to the current ARD ZDF online study, more than 90 percent of women in that age bracket regularly access digital content. A growing and attractive target group: The potential number of end users is currently 5.5 million women - and will increase in the future. The EDITION F topics and offers are moreover also of interest to women who do not fall into the age bracket, as well as men. The total potential of EDITION F can therefore be estimated at eight to ten million people in Germany. Women in this target group spend approx. EUR 2,200 annually on clothing, cosmetics and business trips alone. This information is of particular interest to magazine advertising customers and brands in the shop. An overview of the EDITION F members. And: The concept behind the EDITION F platform can be transferred to markets outside of Germany as well. We already have visitors from Austria and Switzerland. Markets in Scandinavia, Great Britain and the USA also host a strongly under-served EDITION F target group. EDITION F was founded by Nora-Vanessa Wohlert und Susann Hoffmann. They are a committed team that has worked together previously. Content is highly important to Nora. Nora-Vanessa Wohlert is the founder and managing director of EDITION F and is responsible for editing, the community, HR and finances. Susann has a passion for communication and almost always thinks in terms of advertising texts and campaigns. Susann Hoffmann is the founder and managing director of EDITION F and is responsible for communication, marketing, products and sales. Teresa is not only the Twitter queen, she is also a passionate author. Teresa Bücker is the head of editorial workflow as well as day-to-day operations. Christian Kapitzke was the first employee of EDITION F, and he not only serves as our head of development, but also loves structure. Jannis is the creative oddball and our night owl. Jannis Reinsch is a designer and frontend developer. He is responsible for design, UI, UX and frontend development. Lisa's texts will make you smile. Lisa Seelig is a freelance editor and the newest EDITION F team member. Silvia always finds the coolest looks for us and is responsible for our shopping addiction. Silvia Follmann works as a freelance editor for fashion and shopping topics at EDITION F.
Thanks to her charming personality, Fousieh is a real sales talent. Fousieh Mobayen recently joined us as a freelance sales and marketing manager. What is the Current Status and What Can We Expect Next? EDITION F has already achieved numerous important milestones. EDITION F concluded a business angel round with renowned investors in March 2014. EDITION F has doubled its traffic each month since the beta launch in May 2014. In October, we reached more than 55,000 visitors. EDITION F has been online with the beta version of the job market and the market place since October. EDITION F was able to win over renowned customers in all monetization areas. We achieved our first five-figure turnover in November. EDITION F has strong partners. In the first months, we were able to attract strong cooperation partners such as Manager Magazin, Impulse, Capital, Huffington Post, SisterMagazin and TheChanger as content partners. In addition, EDITION F already has more than 50 expert authors writing for the magazine. EDITION F is popular in the media. Numerous public, specialized, women's and start-up media outlets have written articles about us. These include Myself, Handelsblatt, Gründerszene and Süddeutsche Zeitung. Currently, EDITION F is taking further important steps. Soon, EDITION F will not only present new features but also extend their design in order to motivate purchase incentives and interaction opportunities resulting in additional clicks per visit. Further relevant milestones are in preparation. User generated content (articles by users): In the coming weeks, we will develop templates for user generated content in order to make writing articles even easier. This model is successfully employed by media such as Buzzfeed, Medium or Huffington Post and will further increase our article frequency. Launch of a shop interface: In order to further increase purchase incentives and customer usability, we will provide a shop interface in the shopping area of our site. Backend development: We are currently working on an individual administration system for corporate customers in order to promote scalability. This system will make booking, design and maintenance of company profiles and jobs as simple as possible. Online marketing: We will make EDITION F the leading brand through targeted investments in online marketing. Our goal is to significantly expand our reach. In order to do so, we will start investing in online marketing. Premium memberships: With an according reach and the trust placed in EDITION F as a brand it will be possible to provide charged premium features for members with premium profiles. Internationalization: EDITION F has the potential to expand its reach beyond the German market to foreign markets. We are preparing internationalization with the proof-of-market in Germany. What are our plans for the crowdfunding capital? We will focus on developing the brand, broadening our reach as well as increasing products and features. We want to develop EDITION F as a leading brand in cooperation with you. To this end, we plan to notably invest in team building and online marketing (depending on crowdfunding amount). We, the team of founders, financed the first months from September 2014 to February 2014 ourselves. The initial stage was followed by the first EUR 125,000 financing round. In November, we concluded the second financing round worth EUR 100,593. Our investors include, amongst others, the venture capital company Vogel Ventures and West Tech Ventures as well as well-connected business angels such as Factory founder Simon Schäfer, Pinterest DACH manager and former publishing director of Gruner + Jahr Jan Honsel, and TV producer Michael Heiks. "EDITION F was able to achieve proof-of-concept within an incredibly short time frame. That is a clear sign that their idea is exactly what people are looking for which results in immense business potential." "EDITION F has shown that journalistic content can be the base for a strong and scalable business model. Because they speak to the target group, involve them and therefore create brand loyalty. Their digital focus enables smooth integration of services catered to generating revenue. This target group is extremely relevant - especially for marketing purposes." EDITION F is an online platform where visitors do not merely passively consume but actively engage instead - users can connect with one another and exchange ideas, comment on articles or write articles themselves as well as sharing them in their respective networks. For us, Companisto is an opportunity to allow the community and the crowd to share in our corporate vision and success. At EDITION F, the community plays a central role and has been our main focus since the launch.